Trough the year I wrote a few applets that I use in combination with media/extra keys on my keyboard. Reading the Arch Linux BBS yesterday I found an interesting script called the "ThinkPad Presentation Manager" that offers a quick selection for enabling external displays. Ideal for binding with the Presentation key found on many laptops, and on my TravelMate. Until now I used a bunch of shell aliases to enable some commonly used setups, like "tvon" for watching movies or "vgawine" for playing Syberia. I liked the idea and find it to be a nicer solution than shell aliases, so I wrote my own with Python and pygtk. 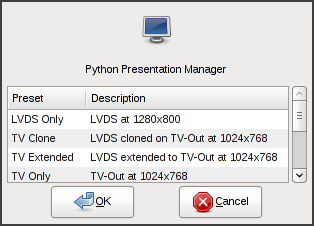 Pypres is a small utility for enabling external displays based on presets, intended to be used with the "Presentation" media button found on many laptops. Double-click on a preset or selecting one and pressing the OK button will invoke xrandr and exit. The code could also serve me as a good skeleton for quickly creating new small ListView/TreeView utilities in the future.